Throughout Autumn 2017, multi-disciplinary designer Yemi Awosile was our artist in residence at Thornwood Care Home in Bexhill-on-Sea, home to sixteen people living with dementia. 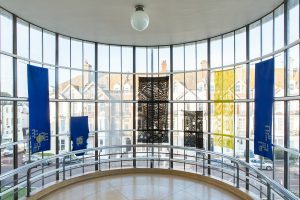 The residency was organised by the De La Warr Pavilion in association with Open School East, and funded by a Paul Hamlyn Foundation Test and Explore grant. Awosile engaged with Thornwood Care Home residents and staff in conversation and creative activities. Out of this, she developed a collection of digitally embroidered fabrics inspired by these encounters, and the site. Awosile tested how craft innovation might help to bridge the gap between a younger generation of digital natives, and those brought up before the digital age: challenging age and ability related stereotypes, as well as attitudes to craft. Yemi Awosile (b. 1984) lives in London. She was raised in North West London near Ladbroke Grove where she was largely influenced by the local area and second-hand markets on Goldborne Road and Portobello Road. 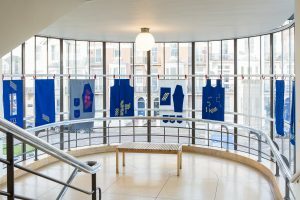 She trained as a textile designer at the Royal College of Art and Chelsea College of Art, and is currently teaching as a visiting tutor at Loughborough University and Chelsea College of Art. Recent projects include collaborations with PEER, Stanley Picker Gallery, Tate, Contemporary And (C&), ICA, Bernie Grant Arts Centre and the British Council Pakistan. As part of her working practice, she re-purposes everyday materials to explore the relationship between people and materials. Her most recent work looks at unexpected parallels between different social groups in urban spaces.